Moira Jeffrey, Chair: I think the thing that really struck me about both Suzanne’s presentation and the break out groups was the very different types of conversations that we might be having, and the very different voices that we have got here, in the room, tonight. This next stage of the evening, I think, is the chance to open up to some of these different experiences and some of these different voices. There will be questions that you have regarding the practice that you have seen and the thoughts that that raised. The Working in Public leaflets should help you find those people and address those questions. This session will be about these panellists, but if you have things you want to find out about the Core Group, please do speak to them when you can later on this evening, or please do look at their work, and follow the kind of inspiration or the spark that they may have set off. The group that we have round the table now, I think, represent a very interesting and diverse set of experiences and will bring to this notion of the artist and public very different perspectives. First of all, on the extreme left here, we have Professor John Caughie. He is Professor of Film and Television Studies at the University of Glasgow. His books include the ‘Companion to British and Irish Cinema’ and ‘Television Drama: Realism, Modernism and British Culture’. He is chair of the Arts and Humanities Research Council, Research Committee. Next to John is Dr Emily Brady. 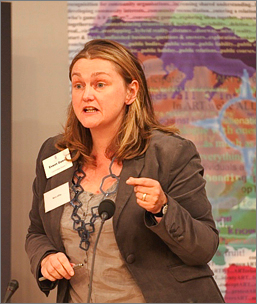 She is a lecturer in Human Geography at The Institute of Geography at the University of Edinburgh. Her research interests brings together the disciplines of philosophy and cultural geography. These include environmental ethics and aesthetics. Here on my right is Jay Koh. He is an artist whose art practice includes creating art works; curating exhibitions; writing and publishing: organising seminars, workshops and community capacity building. He is currently working with the City Arts Centre in Dublin [www.cityarts.ie] curating a three-year inter-cultural project, and in the Winter he is going to be working in both Burma and Vietnam. Nicol Stephen we have already met. I would like to open up a question which is one I think applies to everybody in the room, but I am going to ruthlessly address that question to the panel. I suppose it is really about the impacts of what we have seen and heard tonight. I am interested in the panel’s responses or reflections to what has been raised so far. We have all had very different experiences, been in very different break-out groups. We have all had the experience of hearing Suzanne’s presentation. I am wondering what these has raised in your minds. In particular, responses around the relationship between the artist and the public. So I wonder if I might just start by asking John to kick off. John Caughie: Some of the questions I have come out of that teaching experience. With characteristic frankness, my colleagues in the department, who saw my name on the programme for this event, asked rather bluntly, ‘What are you doing there?’. And I have to say that I was not quite sure what I was doing there. But I think my brief, actually, is probably the last element on it, which is Chair of the AHRC Research Committee. Before I was Chair of the AHRC Research Committee, I was Chair of the Visual Arts and Media Panel and I have just worked out with Anne that I think I chaired the Committee at a time that we funded the initial On The Edge project at Gray’s School of Art. I suppose, one of the questions that we are constantly facing in the Arts and Humanities Research Council in the UK is that we cover practice-based art research as well as general humanities research. Most of the European Research Councils are not interested in practice-based creative and performing arts. The Arts and Humanities Research Council is. And it is a major funder. It is maybe very small in the UK in comparison with the Medical Research Council or the other Science Research Councils. But compared with Federal funding in the US, we are really quite big. So, the AHRC is a big funder and it is important in that respect. The AHRC is constantly wrestling with the boundary between what we should be funding and what the Arts Councils should be funding. Where is the boundary between art as a research activity and art as an expressive activity. We are spending public funding on research. As well as looking for excellent research, we are also looking for dissemination. The key term at the moment is knowledge transfer, or, as it is coming to be known, knowledge exchange. We are looking for public impact. This project, in so far as it began life as a research project, is hitting a lot of these buttons. I suppose the question I have (and it is one that I throw into the arena, as it were) is, how does funding change art; how does the source of the funding impact on art – so that you have not just got different publics, you also have different art activities, and each applies to different funders. That notion of who funds the art very often makes a difference to what the art actually is. The other area I want to draw attention to relates to the course I teach at Glasgow in Film and Television Studies. It is a course on the historic avant garde. I have not actually taught it for about eight years, but I am teaching it next semester. I was beginning to think about what has changed, and Anne Douglas, in discussion we had before this event, recommended Grant Kester’s work. The notion of the dialogic, in art, seems to be a concept that has been in art for a long time – since Bakhtin we have had dialogic art. But I think it has taken on a new resonance now and it is taking on the resonance not just of the dialogic as a property of art works, but the dialogic as a quite specific relationship with the public – or with quite discrete publics. I was interested in Jean Cameron’s talk in the break-out session that I was in. She talked about the artist as producer which, again, is a concept that is familiar from Walter Benjamin, but actually has taken on a very different resonance now – that the artist is actually a community liaison officer, a project fundraiser, a producer in the sense in which film producers ‘produce’ films, a person who does not just create a work of art but who ‘produces’ the context in which it will be received. The notion of the artist who is only concerned with creativity and self-expression –which obviously has been a very stable notion for a very long time – is one of the things that has changed. I am really interested in that. I suppose one of the other questions that I would throw out is the question of evaluation. What would bad public art look like? The terms of reference of evaluation, I think are slipping. Moira Jeffrey Chair: I would like to bring the artists into this conversation at this stage. I think that John has raised quite a lot about who an artist might be. I wonder about Jay Koh’s response to what we have heard so far. Jay Koh: I am not going to that directly. I think of something that is a very visibly present in this room: the poster. I am sure everyone of you have been looking at these posters. You are reading them in a way, and if you are conscious from your cultural background; your intellectual dissemination of the message that comes across. When you hear an artist speak about a project, I think, again, different meanings come into your consciousness. Perhaps, if you invest some more time in this poster and look at the background of the project, then more meaning comes in. So, now I am actually referring to a kind of non-verbal dialogue that is generated by these posters which the previous speaker has brought up – the dialogical process of projection. For me, it is very interesting because we are actually speaking in a space that projects power. This projection of power is also visible and non-visible. So, again, how is this meaning created? Now, to come back to the artist – what kind of position does an artist take when an artist has decided to go into the public space to interact? The intention, the message: is that sufficient in order to create a dialogue, or does an artist have to worry about the other kind of projection that comes out of the creation of meaning? Maybe through all these different ways of balancing the projection and conscious and unconscious and site-specific receiving of the message, it is not easy for an artist to create meaning because the artist alone is not the main creator. It depends on the viewer. Emily Brady: I suppose I am holding up the environmental end on the panel – in a way. I was interested in listening to Suzanne’s talk, and then trying to think about some of the things that she said and how the environment fits into that, or how some of the things she said then fit into an environmental context. I was struck, in particular, I think, by two points she made. First, that art makes things visible. I think that the artist – in particular an ecological artist or an environmental artist – is so well placed to negotiate that space around human/nature relations and in the green break-out group (aptly named) there was a little bit of that on the poster from Reiko Goto. I think, ecological artists can make visible a number of kinds of issues, concepts, problems. We can talk on a global scale about climate change and we can talk on a much, much, smaller scale about the loss of the habitat of a particular species or the particular way in which certain human technology is affecting a bird – a raptor, for example. Lynne Hull has done some interesting work on this. It is about the artist making these kinds of things visible and in an environmental context, making large political issues, particular kinds of human/nature relations visible. Also, Suzanne [Lacy] mentioned art as a civic negotiation. I was thinking, ‘well, what does that mean in the space of the environment – with the environment as a kind of public space – what is being negotiated there?’ Again, it is thinking about nature/human relations and the way in which art can contribute, for instance through ecological restoration projects which involve artists in a deep way. I also thought a little bit about the role of the audience. I am not trying to set up a polarity, but I am thinking about the audience for art works. I have worked on the idea of aesthetic communication; the idea that through an experience, an artwork – whether it be within a gallery, or outdoors in a public space, or into the natural environment – the kind of sharing that can go on in our judgements about works of art. There is a kind of aesthetic communication that takes place as much through disagreement and through agreement. So, the presentations have prompted me to think about the role of the artist, but also the way in which the audience (to come back to what Jay Koh was saying) is also creating meaning. Finally, I just wanted to finish with one really interesting question – well, it was a statement that was made in Ruth Barker’s presentation in the green break out group earlier. I was really struck by it and I just want to throw it out. She said, ‘public art makes us the most human of all’. I wanted to ask, ‘why?’, and ‘how?’. It was a really interesting point she made. Moira Jeffrey, Chair: Nicol [Stephen], I am interested in your perspective here. What are artists and educators and arts administrators doing in this territory? Are they encroaching on your territory? Nicol Stephen: Well, I guess I come at this from the viewpoint of the organisation, rather than the artist. I think there are interesting comparisons with some of the big organisations, the public services – whether it is health or education or criminal justice or any of these big areas of public policy, public delivery. Organisational behaviour is something that is really interesting for me. Big corporations often emphasise their environmental credentials or their ethical commitments. Health and safety issues and environmental issues can make or break their companies. Some will say that these commitments go absolutely to the core of their company, but you sometimes wonder whether that is really the case. I can remember – not so long ago, a few months ago – a gentleman called Mr Bill Gates visited this building. They had a Microsoft Global Leaders’ Conference here. Can I just ask you to imagine looking around the room at the Microsoft delegates and those who were represented at the conference, and their style of dress; their approach; their attitude to life. There is an organisation where, if you compare it with Apple and Steve Jobs and the sort of culture they approach at Apple, you get a very different organisational behaviour. Another good example of that is in the great world of cosmetics and perfume, and you think of the big organisations there. Think what Anita Roddick and The Body Shop did in terms of changing public attitude, changing the culture, changing the attitude of many young girls – particularly girls, particularly young people. You know, I believe that if you start to get this right, if you start to get the posters right and the people right and the artistic involvement right, you can make a big difference – but it should not be a bolt-on. It should not be treated the way some of these big organisations some times treat the environment, sometimes treat health and safety, sometimes treat sponsorships and community arts projects. I think it has got to go to the core of the organisation. You can start to see from the video from what Suzanne has done; from what others have done – at its best, this can change the world and it can certainly change some organisations. And some of these organisations badly need changing. They need more of the spirit and the culture and the attitude that you can bring. Moira Jeffrey, Chair: Nicol [Stephen] has raised a very interesting aspiration about core values. I would like to invite questions from the audience so that we can deal with it. Again, I think Suzanne [Lacy] used the words ‘nitty gritty’ as well. I kind of like these metaphors around – getting down to some kind of business. There is a roving mike – two roving mikes. Moira Jeffrey, Chair: Question at the back. I wonder if people presenting questions could let us know their name and their context. Judy Barrow: I am Judy Barrow, I am not an artist – I do apologise. I am a community liaison person. My comment, really, I’m more throwing this out to see what people think is, a lot of the work I have done with Venda Pollock is bringing the local community – the public, if you like – into the thinking about public art – not just about statues where so often the response is, ‘when are we going to get our new kitchens?’. What I would like to know is, how have people dealt with that sort of response? You mentioned the word ‘meaning’. For us it comes down to the relevance of the public art, and the budget. Explaining to local people that budget is there for art; please use it; please take advantage of the artists, as it were. In Raploch we have turned the cultural identity into public art and improved the public, environmental space, if you like. We have ticked a lot of boxes, but it took a lot of work and we needed a lot of back-up – and I have to say, the budget was not always there. So, I wanted to know how the artists felt because I know how the community and myself felt. Did you have any struggles getting your ideas across to the community? David Haley: David Haley, ecological artist and Research Fellow at Manchester Metropolitan University. I just wanted to touch on some of the points that the Panel have mentioned already, particularly the question of power; particularly the question of funding. Two years ago I attended a conference at Lille about EU INTEREG funding – billions and billions of Euro spent on transnational projects. There were well over a thousand delegates. Two distinct areas – issues – that were not being tackled at all (this is two years ago), were climate change and cultural diversity. Now, I do not see those billions of Euro, from those projects, actually being put into the cultural projects. I do not see them tackling, actually – even despite the views that we hear regularly these days about climate change – I do not see them being spent on these key issues. That funding, in Europe, has virtually no democratic voice. These are all done by governments, people do not know what they are voting for, in this sense. One of the things that projects, I believe, that Suzanne [Lacy] and others here have created is that, first of all, it allows people, perhaps, to enter the dialogue – gain permission to enter the dialogue. Having entered the dialogue, perhaps those projects can shift the language; shift the metaphors by which we live and, perhaps, having shifted that language, it might actually change the stories by which we live. But it is that power, and the funding, that is essential to see those through. It is not the funding leading the art, it is the funding leading our lives. Sylvia Borda: This is a follow-up to the question about public art and its distribution within the community – and I canonly speak in terms of being an artist. I am Sylvia Borda and I am a Guest Lecturer at Queens University, Belfast, and am an Associate Researcher at Emily Carr in Vancouver, Canada. So, I was privileged enough to work with Keith Donnelly in South Lanarkshire delivering a project called ‘EK Modernism’. I have to give context, sadly, so bear with me. I will try and summarise it very quickly. The first project was a one-month residence to photograph and record East Kilbride according to some sort of system. Every artist has to respond according to a system. So it was actually a dialogue with Keith Donnelly, Arts Development Officer. You could say he is almost a conductor or maestro. Every arts development officer has to present information to artists that they are mentoring. Without his knowledge, I would not be able to respond to a project. So, right away, you have to have community liaison with somebody who understands their environment and from that I was able to work with a broader community: library, citizens, schools. So, there was a brokerage that opened up a lot of windows. But with the project enabled, it was for me to record very succinctly something that gets overlooked in places like East Kilbride (which is Scotland’s first new town). It is a Modernist area in which all of the current buildings are being demolished in favour of regeneration. Regeneration can actually displace communities because they have a certain nostalgia. I took on the endeavour to assign value to that area by photographing all these places that had a certain memory and a certain social value. I created an index for people to respond to. I was fortunate enough that the project won a Millennium Commission Award and could continue and that led to a larger publication. Every time you assign value to a community, you can re-legitimise itin a way that someone reconsiders what is in their own local back yard. Sometimes you have to be from elsewhere – so it helps not being a Scot because I could actually say, ‘East Kilbride is interesting and I am proud to be a resident – even if it temporary’. To bring the community further into the endeavour, I proposed to Keith [Donnelly], ‘Could I possibly do an exchange with Canada?’ and that starts to re-legitimise a community much further. So, the second endeavour I came back to Keith [Donnelly] with was based on my own initiative. Knowing the area very well, having lived and worked in East Kilbride over a sixteen-month period. That was actually to take a place very similar in Canada called Surrey, British Columbia, which has a very large youth population – very similar to Oakland – where about 30% is under the age of 18 and do not know their environment very well. For a community to be completely engaged, it has to have a strand that it recognises – and by me enabling citizens and youth to see their own community through my own work, they became the focus. My aim was to make a work in East Kilbride that the inhabitants took over as their own, the work became theirs..
Moira Jeffrey, Chair: I wonder if I can just throw that up then? I mean, that is a suggestion that, in the relationship between art and the public, the artist can assign a value? Do the panel have views on that? Do the audience have views on that? Julie Fiala: Rather than tell you who I am, I am going to illustrate it and I am going to respond to what you are saying not by giving you my CV but by showing you, not how funding can influence art, but how art can influence funding. What I mean by that is, I am someone who is very ambitious, but I believe that in naming something, you also make it real. So, if I say that my mission is to develop a community space I might have to call it an international residency programme to access arts funding. For the community artist to access funding it has to be a centre for well-being. Perhaps we could also be described as non-lawyers who have experience in intellectual property. As artists, we are concerned with speaking and listening because those are the main tenets of what we do. I have seen it in organisations like City Arts in Dublin; I have seen it in organisations like C-Space in London; I have seen it with people like Platform in London. I believe the difference with the way Suzanne Lacy presented this video – for me was very important because, although she spoke, it was not her voice that was representing the ideals which she was trying to move forward. There was a narrative in that video that was very impactful to me and very important. I believe the key difference in the way that today has evolved (and I am not saying this is good or bad) is that it has been very much a debate of experts. You can correct me if I am wrong, but this is what I feel. Moira Jeffrey, Chair: Ok. That, to me, seemed that there was a suggestion there that artists can assign value or can assign a naming of a situation. The other thing that you raised was this dialogue between artists leading funding and funding leading artists. I think John [Caughie] was looking pensive. John Caughie: It was kind the how-do-we-know question? I mean, how do we know that public art has the value that we think it has? How do we know that it is changing people’s attitudes? How do we know that it is giving a legacy? If the Scottish Parliament were funding, say, the shortening of waiting times in hospitals, they would want a measurement. They would want to be able to measure the success or failure of their investment. How do we measure the effect of the investment that public bodies are putting into public art? there must be a little insecurity about it? What happens when priorities change, and hard questions are asked? Do we have any answers other than that art is good for you? Jay Koh: The answer – or, I hope to answer the question – I would like to point to the issue of ownership. Whether the artists name or determine a project, or the funders name or determine a project – if there is no ownership from the public, the project will not sustain itself, and it will fail. How does the funder, the artist, negotiate with members of the public to take over ownership? We are treading on very dangerous ground to think that just one or two power structures – points in the structure – can determine the outcome of a whole project working with the public. There are a lot more other key players there. Until now, we kind of have a universal understanding that the public, the audience, understand what it is all about: funding, artists, the art world – but how about when you work in a society where there are many layers; where there are layers and groups and sub-groups that do not understand art at all – or culture at all? Let alone when this message is translated into another belief system where they have a total understanding or translation of the concept of the dialogue which is different when you work in a different culture or belief system? Then, how do the funders, the artists, create a consensus or common ground (which is also a very contested term – common ground – who sets the common ground, again?). So, here again, how does ownership of a sustainable project come into being? Moira Jeffrey, Chair: Is there a specific response to that from the audience – or the panel? Suzanne Lacy: I am not on the panel, but I would love to respond. I think that evaluation is a really key question, John [Caughie], and I think it is one I have struggled with for a very long time because it is hard to pin down the nature of art, particularly – I guess you mentioned the avant garde – I came out of the tradition of the avant garde. I came out of Kaprow and Beuys and a hard-core art school and yet a very populous working class background and trying to bring those things together is really part of what my research here is about. I think that the win is in first defining the work – or defining the works – maybe it is plural – because, I do not think it is so hard to define it in terms of social outcomes – which Nicol [Stephen] would be interested in, you know. How many cops changed their opinion; how many kids did not get beaten up as a result, and those kinds of things. But I think, the harder question, for me, is aesthetics, and how do you make a determination; and based on what kinds of issues? I think that is what Grant [Kester] is addressing in terms of his theory. It is not just, how do we know that it is good social practice, but how do we know that it is good aesthetic practice? Then the problem becomes for me – you know, sometimes it can be really good social practice (in the stuff I do) and then it miserably fails at art. I am not even sure under what conditions. I stand back and look at it and say, ‘ugh’. And then, sometimes, I know – it is just this one little thing that happened. This reading between this cop and this kid on television and something magical happens and I say, ‘Hmm. That is very interesting. That works.’ But nobody else gets it because they do not quite see from a public vantage point what it is. I think the question you are raising is the key question, and I think it is not one we know the answer to now, but one that we are for the first time ready to start debating on a very broad level. We are debating it theoretically, we are debating it in the art world, we are debating it at the Tate Modern, we are debating it here. I think if politicians can really grapple with something at that intellectual level – not just seeing art as decoration, but as all these other possibilities that the avant garde has always had. It is just unfortunately that not everybody is educated to understand it. But if they can, then I think we can really begin to have a fulsome discourse on those ongoing questions. Moira Jeffrey, Chair: A final question? Lindsay Perth: I wrote a question down. I wrote, ‘how can funding adapt itself to more process-based art practice where the art is dialogical and is less product-based?’ which is basically what you are saying. But I wonder also if funding or the opportunity is there for artists so that it is understood that these things are not six months, or three months, or very often to take part in community in terms of conversations and process-based work. It takes time. I mean, the Oakland – how long were you in Oakland for? Lindsay Perth: Ten years. You know. I think the funding has to reflect that. Which comes back to the first question – yes, what comes first, the chicken or the egg? I am questioning also what the measurements are? How can there be evaluation? And I wonder if the partnerships in the community conversation can be more part of the evaluation, rather than the sound bites, and there can be something more to help measure the end. Moira Jeffrey, Chair: I think what I am hearing there is something about sustained involvement, and I think in terms of Suzanne’s work it is extremely interesting. Not just in terms of how it might be funded, but why you might need to or want to work in such a sustained way? My understanding around the Working in Public programme is a sense of Suzanne reflecting on that sustained activity – that ten-year period. At the same time you have had a – what is shorter, but also sustained involvement – in Scotland through the Working in Public programme. I think at this stage in the evening I would like to invite Suzanne to close this stage of proceedings – really to kind of remark upon why you are here; what has happened here; and that period that you have had of reflection. Suzanne Lacy: Yes, I would love to, and I want to make sure you realise that – because this feels a little bit like a truncated conversation – that we are going to immediately go out there and begin having these conversations with each other and that tonight really is meant to launch this discourse. I want to make just a couple of comments. First, there are many models here, in the UK, already existing. You have seen some of them tonight. You can go back in history – in particular, you have John Latham and Barbara Stevini with an organisation called APG – Artists Placement Group – in the 70s who tried to get artists as social planners in various corporations and governmental industries – not as decorators, but as planners. I think what is critical that politicians and civic leaders realise, is that artists are basically (some artists – not all) a form of intellectual and it is a public intellectual. There are people that care about social problems and there are people that would like to contribute. The contributions may look a little different. They may have orange hair – we do not know. Why I came to Scotland was to participate in a culture of research that goes beyond what I could find in the United States. In my own institution, The Otis College of Art and Design, I have just launched a Phd by practice but, frankly, the discourse around the Phd in practice or the Phd in the arts is just beginning. I have seen a lot of resistance to it. I think that this practice=led Phd programme is an example of a reframing of art as research. You see that going on in the museums, you see it going on around the world, and I think this is a physical evidence of that reframing. So, for me, thinking about art as research is going to be particularly significant when it comes to public realm art because we have to look at how research and how public art, and public realm, and public policy issues might come together – which does touch on your comments about evaluation. I came here at a very opportune moment. Artists are showing a lot more appetite (as Anne Douglas pointed out) for working in public. The major museums in the UK are actually looking at this practice and inviting artists in to teach the museums about this practice. You are talking about, ‘how does creativity feature in our economic and social and public life’ in a very significant way. The Scottish Arts Council, the sponsor for this event, is considering exactly the issues you brought up. How do you know when it is good art? You fund it; you put public money in it; how are we accountable? I think this is a great time. I have been very stimulated so far and this process is just beginning. For me, it has been very rewarding. I want to leave you with just three thoughts that are important. The first, about research. If we think about fine arts as a research practice (some fine arts – not all), then, what do we end up with? We end up with a kind of a public or, at least, open-ended experimentation. We end up with the ability to frame questions; less coming up with clichés and more coming up with questions. We end up with the paradigm of knowledge seeking. Potentially, if it is public art, knowledge transfer within the art practice, then we can end up with something I think very important – the idea of learning from failures, just as much as from our art. That is why the title of the book I am working on is ‘Imperfect Art – Working In Public’ because it is the least perfect of the studio possibilities. Now, the other thing it does is, it positions Universities as significant partners in this discourse. I think Working in Public has been a very interesting brain child of Anne Douglas – my thesis advisor – who has gone way beyond that role in developing a very discursive, broad, enquiry with lots of participation, launching that as part of my research process. Well, that is a combination of the University and the art thinking coming together in the process, that has brought us here tonight. So, that is one thing. The second thing I want to leave you with is ‘Who is responsible for civic discourse?’ As I said, public discourse is perhaps not quite as eroded in Scotland as it is in the United States. At least, in theory – you know, when I was growing up, public elected officials, organisational leaders, and civic non-elected officials – the kind of people I referred to in that ‘Code 33’ video, were responsible for the quality and the state of civic discourse. Well, look at the current presidency in my country and how he does not sponsor, support, civic discourse. Here we have the highest elected (and I promise I am not just going to do a Bush bash) but the symbolism of this I think is key. We have the highest office – elected office – in our country, truncating at every possible moment civic discourse. Then where are the responsibilities? Has it suddenly shifted over on to the artists of the world that we are supposed to be responsible for public discourse (with very little funding)? I think the partnership between artists and the political sphere is critical. You invite your public intellectuals and your public officials to talk about how to enrich the state of discourse. So, finally, what would this experiment look like; how would it be supported (that is the question you asked); what priorities would it have – would it have access to this kind of space; what negotiations and what compromises would be needed (I think one of the things people are always afraid about artists is that they are these wild cards – you never know quite what they are going to do when you put them in a public space); and then, what happens when things get dangerous? My last point is, things will get dangerous. They always get dangerous in politics – we know that, right? You never know – at least in America – when a camera is waiting to catch you at something you should not be doing (according to the religious right). If we adopt the notion of artist research, then we must embrace the spirit that we have in Universities, which is academic freedom. Here is a common misconception: good public art seeks a uniform instrumentality. What does it do? Another misconception, good art is never functional – you get that in any art magazine. So, the question is, where do we sit in this discourse? At what point in time do we sit there? Is it function; is it non-functional? So, if I am an artist and I go and I promise you I am going to arouse civic discourse and something goes very wrong and the Free Mumia protester come in – you know – is that an example of a non-delivery in the social or functional realm, or is it a non-delivery in the aesthetic realm, and how do we chew on that? What art does, is it provides us with an opportunity to reflect upon the implications of our civic actions and the implications of the direction of our civic sphere, such as it is. If artists research in the territory between the aesthetic, the political and the social, then it will not likely be either functional or non-functional at any given time. What it will be, in my book (if it is good), is experimental. It will take risks. It will raise discourse and it will raise discord – it will bring out the differences that exist. I think such art values, above all, the rights of both artists and citizens to raise difficult questions, formulating legitimate debate about what is happening within us; to us; between us; and by us, to our various environments. Art in public – I would close by saying – is a constantly re-inventive process that says, ‘we are worthy and uncontrollable, as is civic debate’. Moira Jeffrey, Chair: On that note I would like to thank all the participants in this evening’s event and all the participants in the Working in Public programme in its widest sense. At this stage, there is wine, there are canapes – I would invite everybody to begin these conversations and to get dangerous as quickly as possible.